If you asked me about my summer staples, you’d probably expect me to say things like jean shorts, a little white dress, some cute sandals, you know, the usual. But don’t think I don’t have a list of summer food staples, too. I mean, would you really expect anything less from someone who writes a site that includes ‘chef’ in the title? When it comes to the things I like to keep in my fridge and pantry in the summertime, I have a few criteria. Because we’re always busy and we’re always entertaining, I like things that are quick, casual, multi-purpose, light and refreshing, elegant, and easily elevated. Of course, a plethora of fruits and veggies fall into this category as do things like cheese, meats (Prosciutto is my fave! ), olives, marinated vegetables, sun-dried tomatoes, roasted red pepper and eggplant, stuffed grape leaves, hummus, fresh juices and lemons and limes for cocktails, and, of course, some bubbly. People often find it funny that they open my fridge to find it perpetually stocked with some bubbly….and I find it equally as funny to open their fridges and find them sans bubbles. I mean, let’s be real, is there a better, more elegant way to elevate the every day than a little bubbly?? I think not. One of my faves I try to keep on hand is Mionetto Prosecco, and no, it's not just because it's Italian like me! 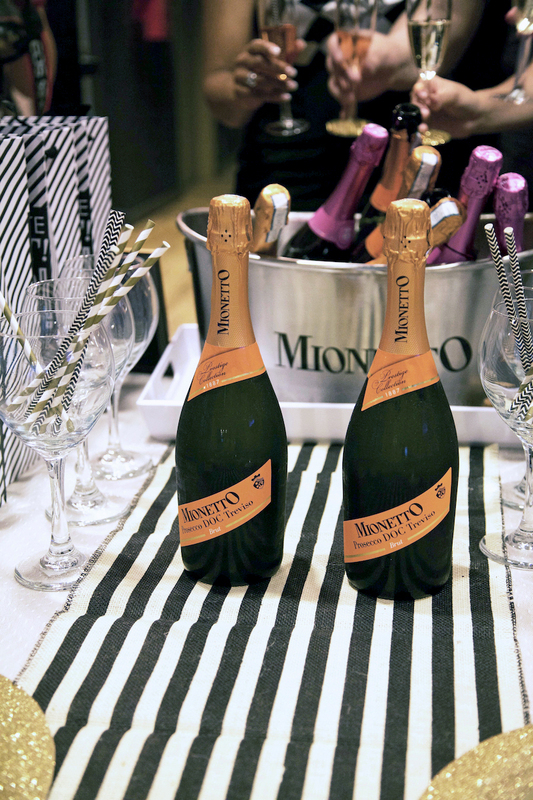 It's simply because Mionetto Prosecco offers a crisp, refreshing taste that is always a crowd pleaser! For those of you who don't know, prosecco is a sparkling wine produced with a minimum of 85% Glera grapes and typically made in the charmat method. The name prosecco derives from a region in Northeast Italy that is government-protected. Because of this mandate, it is the only legal designated area where prosecco can be produced. 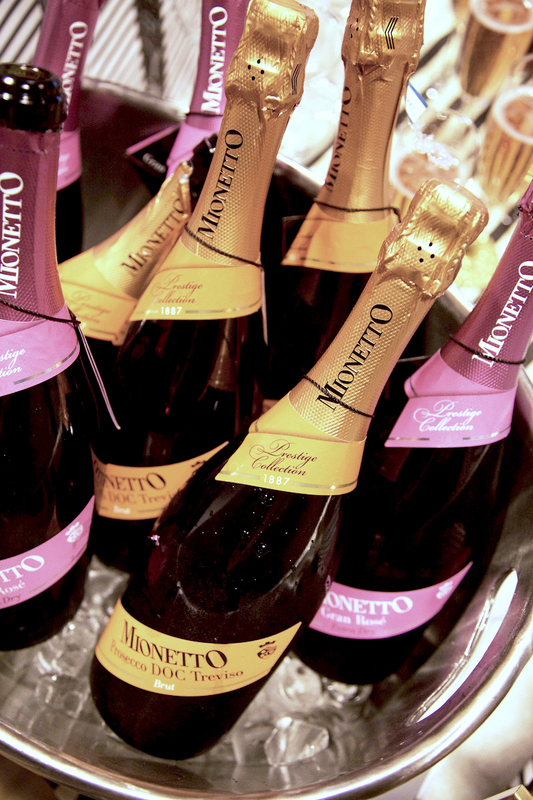 Mionetto Prosecco, located in the Northeastern region of Italy, has been producing prosecco for over 125 years. With four brand pillars focused on quality (they bottle their flagship wines on demand to ensure freshness in the market at all times), style (both in how they craft their wines as well as their brand and bottle being inspired by the world of Italian art, fashion and deisgn), taste (their line of wines provides a whole portfolio of flavor profiles), and heritage (Mionetto was founded in 1887), it’s safe to say that Mionetto Prosecco knows a thing or two when it comes to producing stellar sparkling wines. While prosecco is, of course, perfect all on its own, its equally as good paired with oh-so-many things. Last week, at a Mionetto Prosecco ladies luncheon (see more fun photos below), we enjoyed both the Prestige Prosecco Doc Treviso Brut and the Prestige Gran Rosé Extra Dry paired with mini quiches, a bruschetta bar (So perfect for summer entertaining! ), fresh fruit and little dessert tarts. It didn’t matter if it was the sweet or savory morsels, both bubbles paired so effortlessly with every single bite. Of course, it's nice to be able to just come home on a Tuesday night, gather a few friends, pop open a bottle of prosecco and casually enjoy a a fun but sophisticated beverage in your backyard (or, in my case, on our roof deck) without worrying about mixing or shaking things up. But sometimes, for weekend entertaining purposes, or, ya know, because it’s Wednesday and you’ve successfully made it half way through the week, you want to celebrate with something more, which is where a prosecco cocktail comes in handy. This one, that we have dubbed a 'Summertime Sprtiz' as it is made with tequila and passion fruit juice, is nothing overly entailed but it's still elevated enough to make any summer occasion, from a Monday night to a backyard bbq, sophisticated and fun. Pour tequila or mezcal, simple syrup and passion fruit juice in a flute glass. Top with a generous splash of prosecco and enjoy! What's your favorite way to enjoy prosecco? Do you like it in a cocktail or as is? This post was brought to you in partnership with Mionetto Prosecco. All thoughts and opinions are my own. Content for 21+.